HomePlaying soccer is becoming a good tradition! Playing soccer is becoming a good tradition! 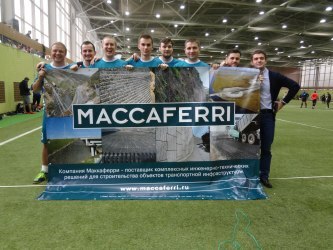 Team building at Maccaferri Russia. On October 24, 2015, Maccaferri soccer team took once again part in the fourth mini-football championship called Cup of Public Roads 2015. The championship was held under the auspices of Pinkov Sports Projects and was timed to the Day of Public Roads Workers. The event was held in F. F. Cherenkov Arena of Spartak Academy and gathered 16 participating organizations that represented industry enterprises and organizations in the field of road construction, engineering, as well as manufacturers of materials and technical solutions. Pinkov Sports Projects is a sport service company, active in the Moscow area, organizing sports tournaments and events for corporate teams with team building purpose. Such events, important part of the Maccaferri HR policy, are designed to ensure a high percentage of participation while enabling staff to get to know one another in a less confronting environment than the office. It is also a great forum to meet all staff team members. Maccaferri has already managed many team building activities with the results always being the same, lots of fun and bonding as a group. We do not only play soccer! To know more about Maccaferri activities contact us.